After flipping through my trade bait, I came across several cards that made me reflect on my purchases & trades over the years. 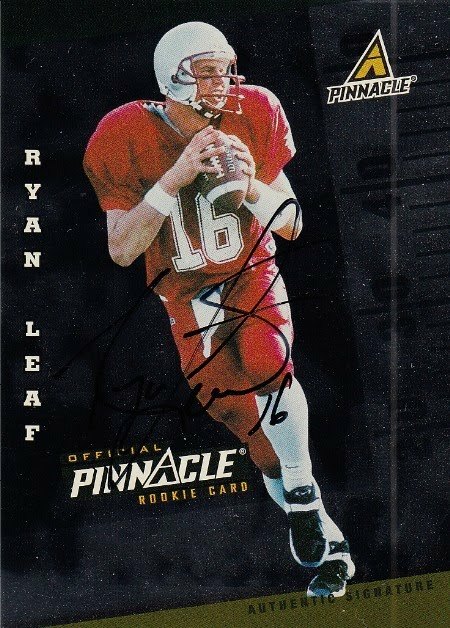 The first card I came across was my 1998 Pinnacle Ryan Leaf autographed numbered to 500. I don't remember what I traded for it, but I do know that I gave up a lot. While playing for Washington St., Mr. Leaf had a crazy game against CAL where he threw 4 or 5 TD's as they dominated the Bears. It was that game that made me think that Ryan Leaf was going to be a superstar in the NFL. His career stats include a 4-17 record as a starter, 14 TD passes, 36 interceptions, and a career passer rating of 50.0. Well, there's no way I could pick lemons in back to back drafts. Right? 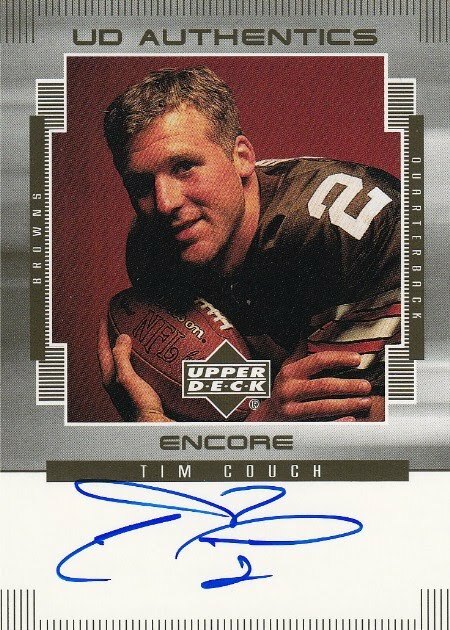 Next up, Tim Couch. I'm not sure exactly why or how I decided to invest in Mr. Couch. My guess is that I jumped on the #1 draft pick bandwagon and rode it into bankruptcy. Okay, well not exactly... but I sure threw away hundreds of dollars picking up his autographs, inserts, and rookies. Something I had blocked out of my memory for the past 10 years. 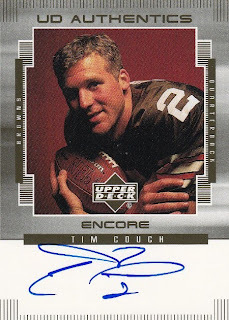 That's until I strolled across my mint 1999 Encore "UD Authentics" Tim Couch autograph. Thankfully, I have no clue how much I spent on this gem. Last, but not least is the Kandi Man, aka Michael Olowokandi. Mr. O was drafted #1 in the 1998 NBA draft, ahead of Vince Carter, Dirk Nowitzki, Paul Pierce, and Antawn Jamison. Unfortunately for me, none of these guys (except the Kandi Man) went to UOP... which along with the fact that he was drafted #1 was the reason I invested some dinero into this fella as well. 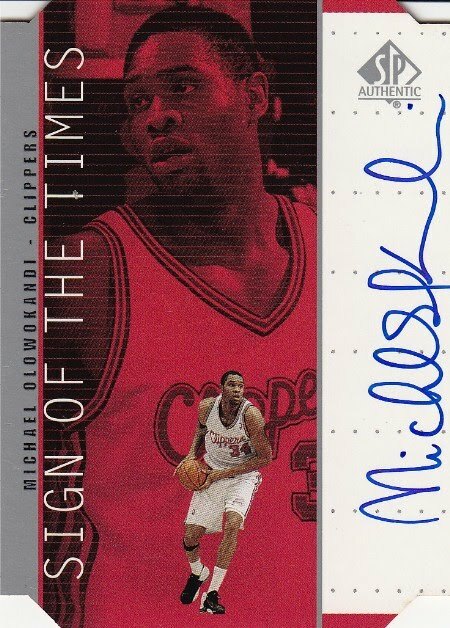 My loss was someone's gain... as I bring to you this pristine 1998 SP Authentic "SOTT" auto of Mr. Olowokandi. Thankfully, Mr. Carter started going off with his crazy dunks, because this caused me to jump ship and dive head first into Vinsanity. Over the past few years, I've mainly been building my collection by purchasing cards off of eBay or by buying boxes from either online dealers or card shows. 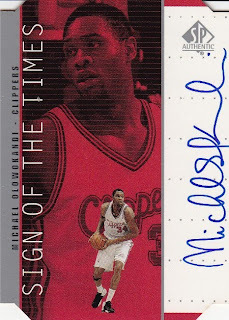 Last Summer, I had some extra time on my hands, so I decided to join an online trading site called Sportscardforum.com. Since then, my personal collection has more than tripled in size. The best part about it was that I was able to trade cards that I didn't want to someone who could appreciate it more than I did. At first, I was a little worried about getting ripped off. But, I took a chance and quickly found out that it's a very reputable site with tons of great collectors. They have forums broken down into sports and categories (ex. trading, buying & selling, hobby discussion, show & tell, box breaks, and of course product reviews) and great moderators who do their best to keep people's posts respectful and appropriate. SCF also has a great feedback system that allows you to leave a positive, negative, or neutral rating for all transactions. It's very similar to eBay's feedback system and you're allowed to write comments as well. To protect people, new members are required to send their cards first until you reach a +20 feedback. This might sound extreme, but it weeds out people who might want to scam. I know nothing is foolproof, but I've made over 100 transactions over the past 9 months and have never been ripped off. Of course, there are some downsides to these trading sites. First of all, there is the issue of shipping methods. Sometimes you'll receive cards in plain white envelopes (PWE), which can be damaged in the postal machines. Another thing that I get frustrated with is people who don't send their cards out when they're suppose to. In other words, they wait until they receive your cards before they ship out. Obviously this isn't an issue if you're a new trader and must send first (or if you've been busted and labeled a "must send first" trader), but if you're an established trader, then you kind of expect that your cards will arrive in a timely manner. Luckily this only happens ever so often. Most people abide by the rules and ship out within a couple of days. The final problem that I've encountered on these trading sites is condition of cards. Every once in awhile, I'll receive cards that are slightly damaged, or smell like smoke. It's never been a major issue, but I could see where I might eventually run into a problem where I'd want to send the card(s) back. If you decide to join, look me up. My username is sanjosefuji and I'm a member on most of these sites, although I primarily trade on sportscardforum. I've been going to baseball games since I was a baby. But to be honest, my first memory of baseball is the Oakland Coliseum and the sounds of Kool & the Gang's famous song, "Celebration". After doing a little research, I was surprised to see that the song came out in the 1980's, which means that I was at least 8 years old when I had those memories. I'm a little ashamed that I can't remember any personal memories before that, but it is what it is. I guess when I think about it, the 80's is where it all started for me. I started playing baseball... I started following baseball... and most importantly... I started collecting cards. But that's another story. Today, I'm writing about one of my favorite players growing up. Like most people, I picked my idols for specific reasons. I liked Rickey Henderson, because he was the A's best player. I liked Ozzie Smith, because he made impossible defensive plays and could do a back-flip. And I liked Tony Gwynn and Kirby Puckett, because they were kind of stocky, but could hit for average. All four of these players have one thing in common... I liked them because of their baseball skills. Well... the last guy I idolized was an amazing pitcher, but I could care less about his skills. In fact the reason I liked him was because he had the coolest mustache in baseball. 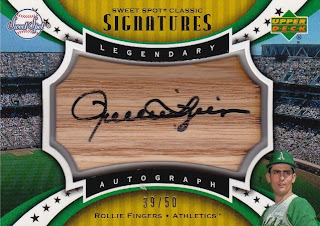 Yep, you guessed it... Rollie Fingers. I started seeing him on cards that I pulled out of packs. Later I found out that a buddy of mine is related to him, so that made Mr. Fingers even cooler. 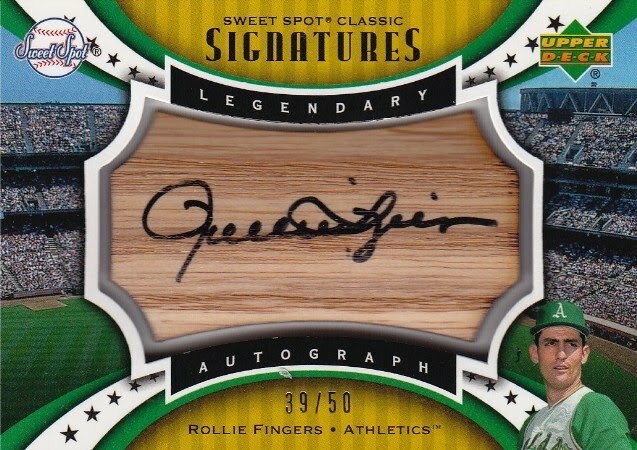 Eventually, I discovered that he played for the A's & Padres (my two favorite teams) and I became a fan of his for life. Last week, I picked up my second autograph of Mr. Mustache and I'm glad I bought it, because it brought back a lot of great memories from my childhood. Thank you Mr. Fingers/Mr. Mustache!